The fact that the November 1 release of Splitfish’s latest controllers are meant to coincide with Call of Duty: Black Ops should be a strong enough hint for their use. Compatible with the Mac, PC and PS3, the three new controllers will reach the gaming faithful in time to satisfy their trigger fingers. We gotta admit we’re pretty excited about the new CoD ourselves, even if the viral trailers left much to be desired. Appropriately named after dangerous fish, the Fragfx Shark, Barracuda and Piranha come in fearsome pairs. 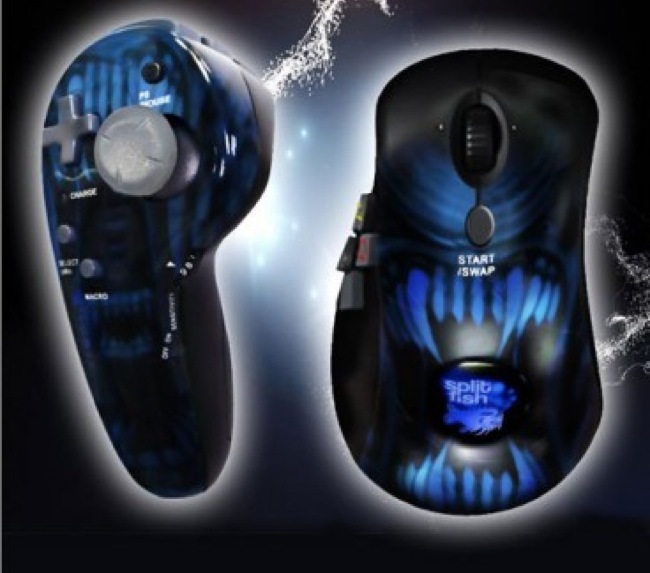 Each includes a tricked out multi-button mouse for killing bad guys and half a game console to move around with. The main difference between the three is the Shark is wireless while its two siblings aren’t. Each pair runs on a single 50-hour AA battery and are priced according to the model. The Shark is the most expensive at $89.99, the Barracuda earns second place in the money scale for $69.99 and the most affordable of the lot is the $49.99 Piranha.